Grand Lake Festivals features Osage Stomp String Band at the Jana Jae Fiddle Camp! Great free entertainment at Snider’s Camp in Grove on Fri. & Sat. evenings, September 4 & 5 as The Jana Jae Fiddle Camp and Music Festival brings musicians and entertainment to the Grand Lake area over Labor Day weekend, Sept. 4, 5 & 6. All events at Snider’s Camp, located just south of Grove on the beautiful bank of Grand Lake O’ the Cherokees, are free to the public with great food and entertainment on Friday and Saturday nights. The food line opens at 6:30 p.m. with delicious barbeque on Friday night and a fish fry on Saturday night; food is $8 a plate. Bring your lawn chairs and enjoy good food, great entertainment and jammin’!! Entertainment on Friday & Saturday nights at Snider’s Camp will include the popular Osage Stomp String Band. 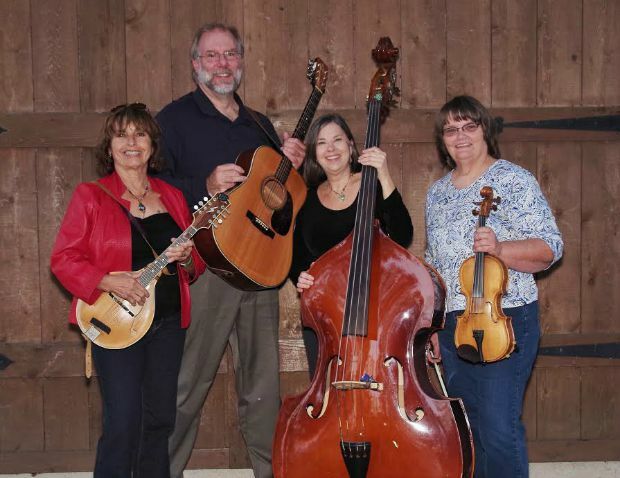 Keeping the old time traditionals alive and lively, spectators will stomp their feet to this string band’s fiddle tunes featuring Shirley Adams on the fiddle, Lucy Weberling, mandolin, Bob Cross, guitar and Rosie Gorrell, bass. Cowboy Jim Garling, singer, songwriter and guitarist will join Jana Jae and others on stage as they wow the audience with their talent playing favorites from western to some of the classics. Anyone who plays the guitar or wants to learn to play the guitar can sign up to participate in this fun weekend with Jim Garling who will be instructing guitar workshop the entire weekend!! The Amateur Fiddle Contest highlights the evening on Saturday and is always great fun for all. For those not enrolled in the Fiddle Camp, registration for this contest is $5 with cash awards going to the top three winners in six divisions. Daytime fiddle workshops will be held at the Grove Civic Center on Saturday and Sunday from 10 a.m. to 4 p.m.
Fiddle instructors will demonstrate and teach various music styles including Celtic, old-time, bluegrass and contest. There will be other very interesting and entertaining sessions as the participants learn to play in jams, put on a successful performance, compete in contests, handle stage fright, play harmony for twin or triple fiddles and much more. All participants will be featured in the Fiddle Camp finale on Sunday afternoon at 3:00 p.m. at the Civic Center. Admission is free to all events. There will also be bass and mandolin workshops offered for $10 registration fee (free to those registered in the Fiddle Camp). These workshops will be held at noon on Saturday, September 5. This Festival is made possible by volunteers of Grand Lake Festivals, Inc., many local and area sponsors, the area media, with the assistance of the Oklahoma Arts Council and the National Endowment for the Arts and is a special event as the participants share their talents with each other and the spectators. The Jana Jae Fiddle Camp is held at the Grove Civic Center Sat. and Sun., September 5 & 6, and at Snider’s Camp Fri. and Sat. evenings, September 4 & 5. For more information or to register for the workshops visit www.grandlakefestivals.com or call (918) 786-8896. Special entertainment various times through the weekend. Bring lawn chairs to Snider’s Camp. 7:00 p.m. Barbecue Dinner ($8 a plate), Kick-off Party & Entertainment Jam with old & new friends–enjoy! NextThe Grand Lake Living Mobile App Is Live – Download It Now!